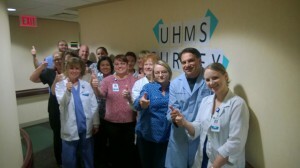 Comprehensive Healthcare prepares hyperbaric teams to go through the accreditation survey conducted by the Undersea and Hyperbaric Medical Society (UHMS). Comprehensive congratulates this Chicago-area team on passing their survey with flying colors! The final report is due in December 2014. The Medical Director is Board Certified in Hyperbaric Medicine. He was available throughout the survey. They are a seamless team that clearly communicates well! The safety program was outstanding!